NUSA DUA, Indonesia — Even for Bali, the famous Indonesian resort island so beloved of the rich, powerful, and famous, the week-long visit of King Salman of Saudi Arabia and his entourage of 1,500 is proving a unique happening. Some Middle East observers believe the extended visit to Indonesia is part of an effort to court support from the world’s most populous Muslim nation. Saudi Arabia is at serious odds in the Gulf with Iran. The king’s tour comes after Widodo visited Tehran in December and agreed to increase bilateral relations. “I think the Saudi people understand the importance of this Asia tour — which is aimed at supporting the implementation of the Saudi Vision 2030,” said Zuhairi Misrawi, director of the Jakarta-based Moderate Muslim Society. The main Saudi intention is to reduce the Gulf nation’s economic reliance on oil. Tourism could play a part in this. According to Bahar, members of the Saudi entourage will stay on after the king flies to Japan on Sunday, and visit other tourist destinations in the archipelago that have been under consideration for some time for investment potential. People lined the roads from Ngurah Rai Airport on the evening of March 4 when the king arrived, and cheered as dozens of black sedans swished past. A smaller crowd awaited outside the St. Regis Bali in the exclusive Nusa Dua resort, the king’s encampment for the duration. Unlike in the rest of Indonesia, most people on Bali, the Island of Gods to some, are Hindus who worship at numerous temples. Some see the visit to the island as an effort on Saudi Arabia’s part to present a more tolerant face as it opens up to foreign investment. Two other five-star hotels nearby were also fully booked until Sunday. Over 800 rooms had been taken by the Saudis, including the most expensive suite at the St. Regis costing at least 93.5 million rupiah ($5,250) per night. Some 360 cars, mostly black Mercedes-Benz rentals, sat in the hotel car parks costing between 2 million rupiah and 25 million rupiah per day each. “My estimate is that they are spending at least 150 billion rupiah for the hotel stays only,” Asnawi Bahar, chairman of the Indonesian Tour and Travel Agent Association, told the Nikkei Asian Review. That included the Raffles Jakarta, where the king’s specially prepared room cost nearly 130 million rupiah per night. 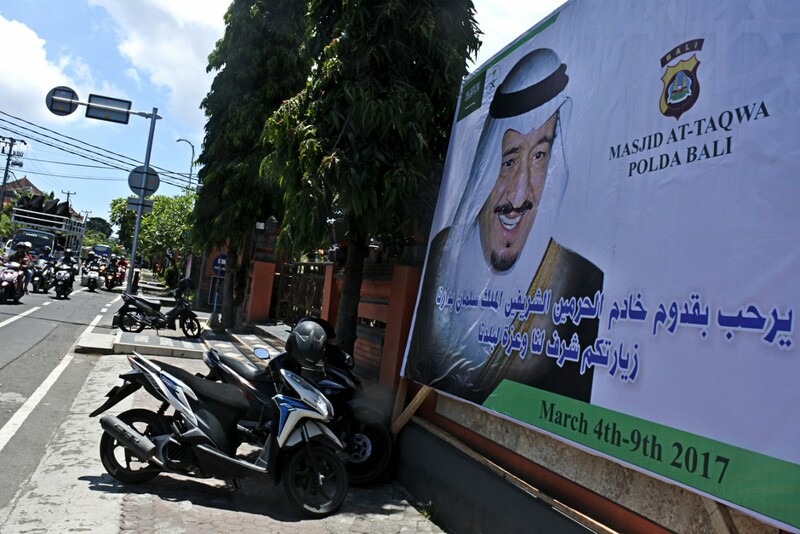 When King Salman arrived in Jakarta on March 1, the sheer size of his entourage grabbed headlines. Indonesia is the second and longest leg in a month-long Asia tour that began in Malaysia and will continue to Japan and China. The entourage in Jakarta had swollen from the 600 who arrived in Kuala Lumpur, and included seven ministers, 19 princes, and 100 security personnel. Jasa Angkasa Semesta (JAS), an Indonesian ground handling company, took care of 11 aircraft — including four freighters — and 460 tons of cargo. After the official visit to Jakarta, where King Salman was received by President Joko Widodo, most of the cargo was transported onwards to Bali. It included two portable escalators to help the octogenarian monarch off and on his plane, four Mercedes-Benz S600 sedans, an X-ray machine, furniture, dozens of large TVs, and tons of halal food and drink. “This is the largest entourage we’ve handled so far,” said Heri Lukmanto, the general manager of JAS, which looked after President Barack Obama and his four aircraft some years back. Tourists were sometimes allowed to pass through, but mostly kept at a distance. A total of 2,500 Indonesian police and military officers were present in Nusa Dua and other tourist hotspots. Security around the airport was heightened hours before the king aircraft touched down. Fully equipped military and police personnel safeguarded the area. With a naval vessel moored close offshore, part of the beach adjacent to the St. Regis was partially enclosed with high wooden fences for the duration of the stay, and dozens of Indonesian and Saudi security personnel on duty. The Saudi ambassador to Jakarta, Osama bin Muhammed Al-Shuibi, said the king went to Bali to spend time enjoying the “sea view.” Officials in Bali said the king likes Bali so much he has decided to extend his stay for three days beyond March 9. In Japan and China, the royal tour will drum up further interest in the $100 billion initial public offering of state-owned Saudi Aramco. Aramco has already sealed $13 billion in deals with its counterparts in Malaysia and Indonesia, broadening its portfolio ahead of a listing in 2018 that will be the largest IPO in history.